On the night of Oct. 29, Hurricane Sandy thundered ashore just south of Atlantic City, N.J., as a Category 1 hurricane packing winds of about 90 mph and creating a storm surge in excess of 10 feet. According to the National Hurricane Center, tropical-storm force winds extended 820 miles from Sandy’s low-pressure center, which combined with two other weather systems and became, in terms of area, the largest storm ever recorded in the Atlantic. It caused between $60 billion and $70 billion in damage. The extent of the devastation at marinas became starkly clear as soon as the sun came up. Boats were lifted off jackstands and left in piles, floating and fixed docks were ripped apart, boats in mooring fields were sunk or swept away, and much boatyard infrastructure was obliterated. BoatUS estimates Sandy damaged or destroyed 65,000 boats at a cost of roughly $650 million. 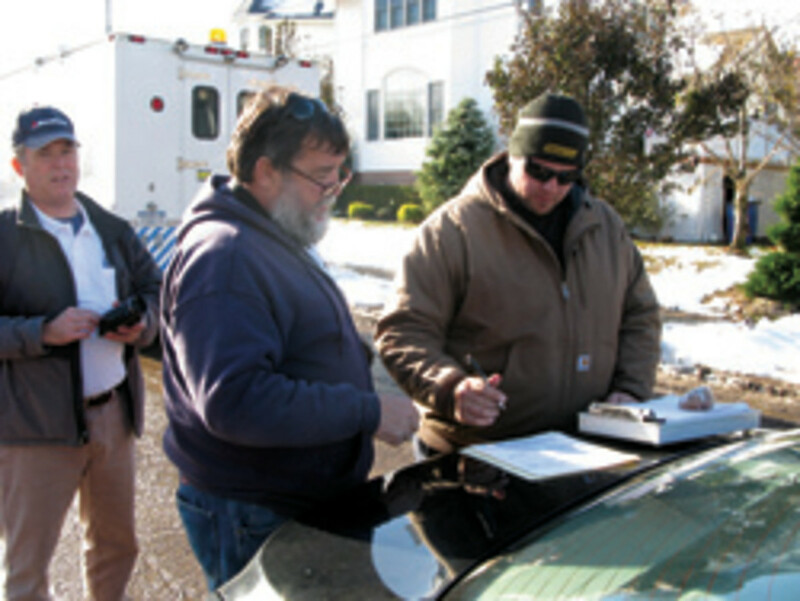 Within 24 hours of Sandy’s landfall, BoatUS Marine Insurance catastrophe teams were on the ground. Composed of adjusters, marine surveyors, salvage company representatives and other support staff, the CAT teams remained in the field for two months, gathering data and reporting to BoatUS. BoatUS insured roughly $8 billion in boats in 2011, the most recent figures available, so it has a vested interest in finding ways for marinas to reduce damage to boats in severe storms. Data collected by the CAT teams revealed weaknesses in some marina hurricane plans and in some infrastructure. It also turned up important lessons that were presented in three webinars in March, offered in partnership with the Association of Marina Industries, based in Warren, R.I. The webinars were designed to provide marina operators with the latest thinking about how to best secure boats on land and in the water during storms. The first webinar — “Sandy Overview: What We’ve Learned” — explained why the storm was so destructive to marinas in New Jersey, New York and Connecticut. It featured statistics and analyses to put Sandy in context with other serious storms. The other webinars — “Securing Boats on Land” and “Securing Boats in the Water” — highlighted what happened to boats, docks and moorings, and suggested steps a marina operator can take to mitigate storm damage. “Most marinas have a hurricane plan, but it’s generally pretty generic,” says Leonard. “A lot of marina operators have not thought through all that well what the specific risks are for their location and for specific types of storm threats. The hurricane plan has to have flexibility that reflects the difference between wind and surge events,” she says. 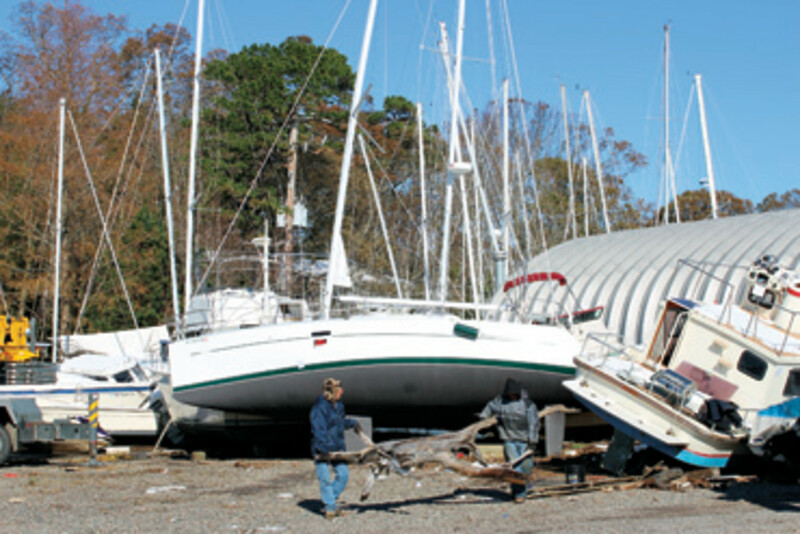 Risks to marinas include surge, waves, wind, debris from neighboring marinas or other facilities, environmental effects, damage to infrastructure, liability from damage to the property of others — for example, a boat breaking loose during a surge event — and insurance coverage that does not reimburse for flooding or other potential hazards, Leonard says. Taking the usual direction of storm winds and factoring in the amount of fetch, for example, can identify potential risk from waves. Once the risk is known, the marina operator can take steps to mitigate it. Many marinas experienced multiple surges over as many as three astronomically high tides during Sandy. The surge was greatest near New York Harbor at more than 10 feet, but surges of 5 to 8 feet occurred from southern New Jersey to western Rhode Island. Most marinas in the affected area were engineered to withstand 6 feet of storm surge, few were more than 5 feet above sea level, and many had infrastructure that was more than 30 years old. Boats secured to floating docks with pilings tall enough to handle the surge suffered the least damage, but in many cases the pilings weren’t tall enough. Docks floated over the pilings and got loose, or the pilings broke because of strong lever action as the docks reached the top. If Sandy’s winds had been Category 3 or higher, the floats that did survive would not have, Leonard says. She adds that a higher percentage of boats survived on fixed docks, but when there was damage, the boats usually were total losses. In Florida and along the Gulf Coast, which typically experiences serious windstorms every five years, the usual practice is to haul and tie down boats. Such practices aren’t common in the Northeast, which on average experiences serious windstorm events once every 22 years. According to the BoatUS findings, if practices similar to those used in Florida had been applied during Sandy, damage would have been reduced. Tying boats down helps keep them from blowing over or floating away in a surge. However, positioning hard points for tie-downs can be problematic. As marinas rebuild after the storm, creating hard points or even installing steel pilings for securing boats in a surge could reduce damage. If boats are tied together, with fenders deployed, and then secured to the hard points with stretchy nylon line with plenty of slack to allow boats to float up, they’ll be more likely to float in place, as opposed to floating away. Making sure drain plugs are in, exhaust pipes are sealed, and seacocks are closed can reduce potential flood damage. Installing pilings on helical anchors and engineering floating docks to fixed hard points on the ocean bottom instead of on pilings can reduce the potential for dock failure. Boats on moorings can survive with the least amount of damage, but the mooring field has to be “thinned” so boats don’t make contact, and there must be sufficient scope to allow for surge, webinar participants were told. Fixing moorings to the ocean floor with helical anchors was determined to be a better alternative than using mushroom anchors or concrete blocks. The three Sandy-related webinars held in March were recorded and will be available, for a small fee, courtesy of BoatUS and the Association of Marina Industries, starting in May. Check the AMI website (www.marinaassociation.org) for more details. BoatUS is revising its hurricane-planning brochure to include the information gleaned in the aftermath of Sandy. The brochure is expected to be available in July. You can access it at www.boatus.com (search: hurricane prep). The AMI, BoatUS and Dozier’s Waterway Guide have created a Web page showing the status of marinas in areas that Sandy hit hard. The information will let boaters see which marinas are open and what services are available. The majority of marinas say they are open for business. The Superstorm Sandy Updates Web page, displayed on the Waterway Guide website, breaks areas into sections, making it easier for boaters to zero in on marinas in specific locations. Access the Web page at www.waterwayguide.com/superstorm-sandy. If your marina is in the affected areas and you want to include it in the database, send an e-mail to superstormsandy@waterwayguide.com. • The name of your marina and the address, phone number, email address and website. • If you’re closed, when you expect to open for business. • Services you can provide — the number of seasonal and transient slips, fuel dock, pumpout, haulout, repair facilities — and the dates these services will be available. • Navigation issues near your marina that boaters should know about.